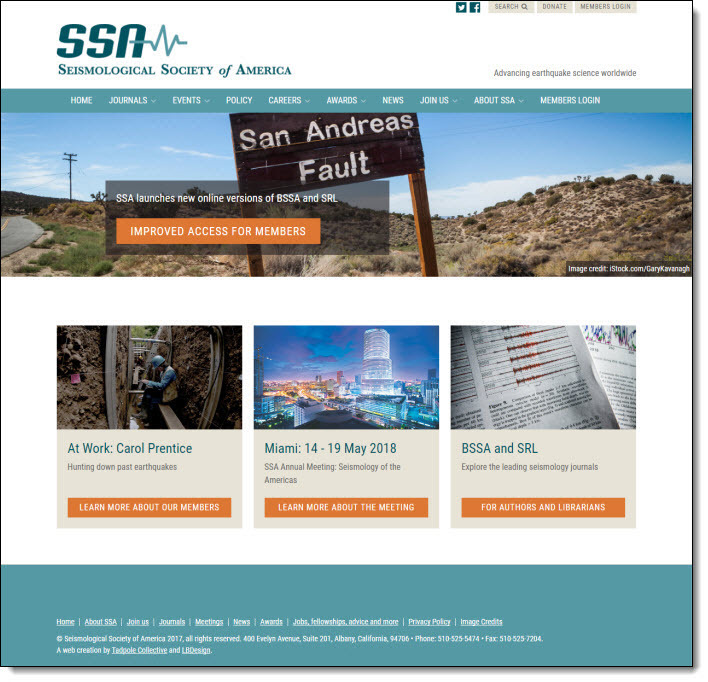 The Seismological Society of America chose CiviCRM to replace multiple proprietary systems and consolidate all their operations with one open-source solution. Tadpole Collective suggested – and SSA showed an interest in – our “CiviCRM Launch Pad” product, a basic CiviCRM installation for managing Contacts, Contributions, Membership and Mailings. We began by importing SSA’s existing contact data from MemberClicks and FilemakerPro and creating the custom fields to meet their tracking requirements. SSA has a complex membership fee structure, so there was a fair amount of work involved in configuring price sets and accounting codes prior to import. We added Event Additional Signup to allow for online registration of SSA’s field trips and their annual meeting, an event with thousands of of participants, and created a CiviMail template that SSA used to announce the event and link through to the CiviEvent registration form. SSA now uses CiviMail for all their newsletters and announcements. Tadpole implemented a single sign-on feature, providing a seamless experience for members bouncing between the SSA website and the third-party subscription sites where its academic journals are published. Once on board with CiviCRM, SSA decided to redesign its WordPress Theme to provide a more streamlined experience for their members and move towards a pure WordPress+CiviCRM solution for all its organizational and outreach activities. Tadpole brought in LB Design to replace SSA’s outdated WordPress Theme, replacing much of the hard-coding with native WordPress functionality and/or plugins. With its new look and feel, the website leverages the best of WordPress and CiviCRM, enabling SSA to better serve their members and the broader community.